Rodney P. Frelinghuysen is serving his eleventh term as the Representative for New Jersey's 11th Congressional District. 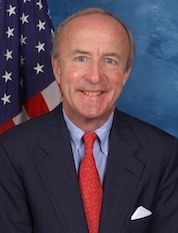 In the 114th Congress, Frelinghuysen serves as New Jersey's senior member of the House Appropriations Committee and on three key appropriations subcommittees: Energy and Water Development, Homeland Security and Defense, where he serves as Chairman. Frelinghuysen represents 54 municipalities in the 11th Congressional District, including communities in Morris, Sussex, Passaic, and Essex Counties. Throughout his time in Congress, Frelinghuysen has worked to lower taxes and provide for a strong national defense. He has been a tireless advocate for New Jersey priorities earning the title “New Jersey’s ‘Go-to-Guy.’” from the New York Times. Frelinghuysen strongly advocates for New Jersey, focusing on the expansion of mass transit, improving homeland security, preserving open space, creating jobs and opportunities, and supporting our military personnel and our veterans.